The large carnivores roaming the Finnish wilderness include the brown bear, the wolf, the lynx and the wolverine. There are not too many of them around, although some areas have more of them than others. 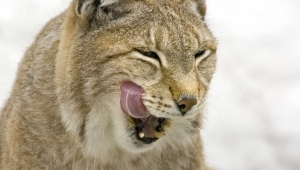 There are around 3 000 lynxes, 1 500 bears and over 200 wolves and wolverines in Finland. To see a bear in the wild is very rare indeed. Something exceptional has happened if you and a bear find yourselves going after the same berry bush. – The bear has an exceptional sense of smell and hearing, so it usually detects a human from far away and flees the scene. However, sometimes the wind might be blowing in the wrong direction, denying the bear the scent. The bear can also be caught off-guard as it is feasting on the carcass of an animal it has killed, says Harri Norberg, Senior Planning Officer at the Finnish Wildlife Agency. The best way to keep bears away is to make noise. So keep chatting with your friend or sing to yourself as you walk in the woods. If you meet a bear, remain calm. Do not shout, but be chatty. Show the bear that you are not threatening it in any way. – Begin your withdrawal. Do not turn your back on the bear so you can see what it does. Running or climbing a tree will do you no good, as the bear is better than you at both. An angry bear will growl, shake its head, turn its ears back and assume the starting position of a track runner. If the bear gets on its hind legs, it does not mean it is about to attack, it is merely trying to get a better read on the situation. The bear might also perform fake attacks to drive away the intruder. If the bear approaches you and you have a berry picking bucket or a loose item of clothing, leave it for the bear so it can sniff it and you can get a head start. Usually the bear will want to solve the situation as peacefully as you do. – If you see a bear cub on the ground or in a tree, its mother is never far away. This is a sign for you to return the way you came, swiftly yet calmly. The mother will defend her cubs if she feels that they are threatened, Norberg says. If the bear does attack you, throw yourself on the ground. – Lie down on the ground on your stomach or in a fetal position and protect your head and the back of your neck with your hands. If you have a backpack, leave it on to shield your back, advises Norberg. Call the emergency exchange and report the dangerous situation. 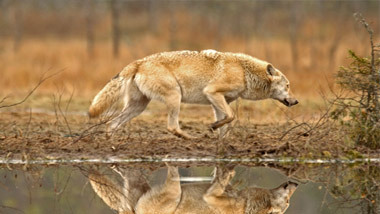 All predator sightings must also be reported to the predator contact person of the local game management association. Even if you only saw bear tracks or droppings, you should report those sightings too. This allows experts to collect valuable information on the numbers, movements and distribution of large carnivores. • The distribution of large carnivores across Finland may be viewed at riistahavainnot.fi. • If you come across tracks left by large carnivores, notify the local predator contact person. His or her contact information may be found in the national database of regional game management associations and the Finnish Wildlife Agency, which is available online at riista.fi/en/game-administration/contact-information/.